Works like a standard 250K potentiometer from settings 1 through 9, but at 10 (full clockwise) takes the pot out of the circuit entirely. This eliminates the path to ground that exists with standard pots in the full setting. The result is increased power and brightness at the "Full On" setting. Unlike the Fender® "No-Load'" potentiometer this style does not click in at 10 when by-passing the circuitry, it simply slides in, it's a nice smooth transition. 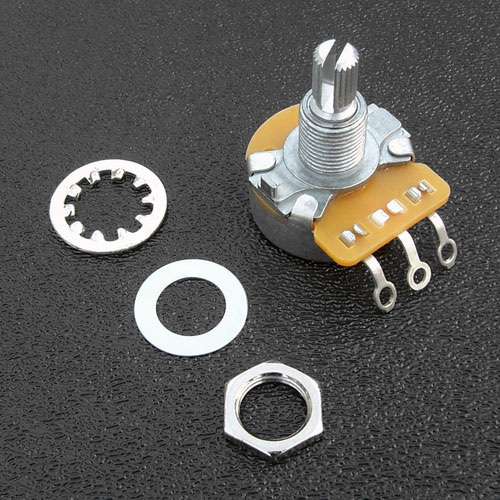 CTS 250k 30% Audio Taper Potentiometer. "No-Load" Capability at Full Counter Clockwise Rotation (10).